Your EOCCO Member Handbook gives you important information about your plan. Please see your Member Handbook or contact us if you have any questions. As a member of EOCCO, you will receive an EOCCO ID card. 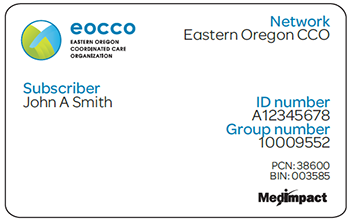 This card identifies you as an EOCCO member and has other important information on it. It tells you what to do in an emergency and lists EOCCO Customer Service phone numbers. Please show your EOCCO member ID card when you see your doctor or pharmacy. Use this form to change your primary care provider (PCP). If you are a member residing in Morrow or Umatilla county, please call 503-765-3521 or fax a physical form to 541-278-8895 to update your PCP. Visit OregONEligibility to apply for the Oregon Health Plan (OHP), renew coverage or report any household changes. EOCCO assist members by providing free rides to their doctor’s appointments. Make decisions about the future of your medial treatment. Request a review of a decision to deny, limit, reduce or terminate a requested covered service or to deny a claim payment. EOCCO classes can help members learn how to manage their medical and behavioral health conditions. This class is intended to help individuals better understand chronic pain, increase confidence in dealing with pain, and provide a range of options to consider for treatment. The program is full of useful tips, techniques and resources to get you moving down the path toward feeling more in control and hopeful despite living with pain. Each session lasts one hour and includes downloadable documents that will be completed in class throughout the four-week program.